Which master bedroom elements are in your current home, and what would you change for your next house? 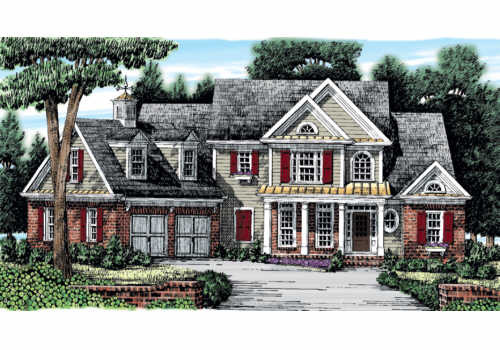 We'll point out some of the style differences in two versions of the same floor plan - The Cotswold by Frank Betz. Each master bedroom has a separate "his" closet in the bedroom and a large walk in closet for her, with a cabinet island, through the bathroom. 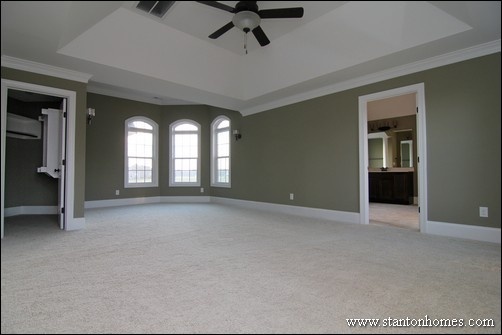 Which would you pick from the photos below: sitting room with vaulted ceiling or hanging light? 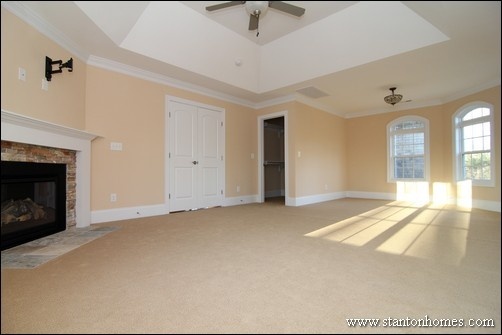 Love the idea of a fireplace in the master suite, or is it something you'll "never use"? 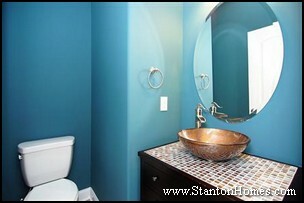 One bedroom has wall sconces and a white painted door to the bathroom. The other has hanging lights and glass French doors. Which is your favorite combination? 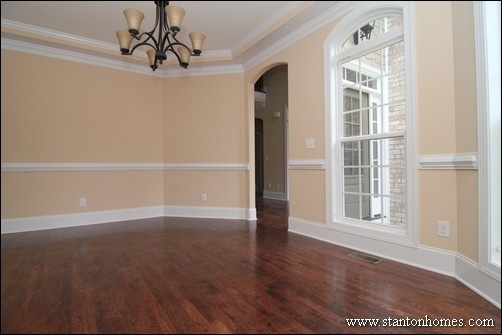 Want to know if you can add a fireplace to the master bedroom in your Raleigh new home floor plan? 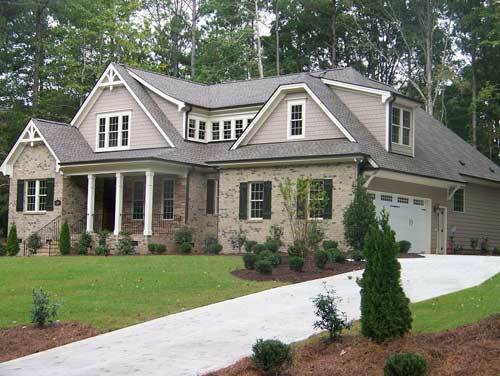 Send us the name/architect or a link to the plan and we'll tell you what it's like to design/build in North Carolina. 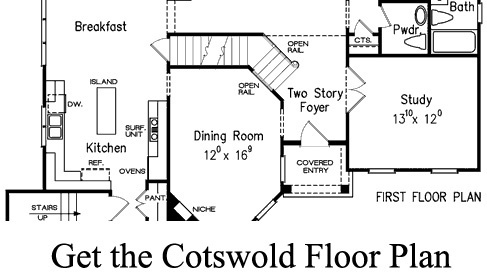 See the Cotswold Floor Plan here. 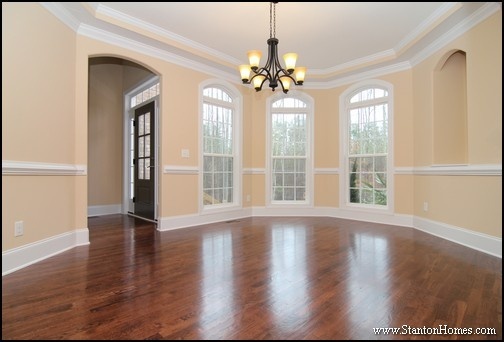 Open floor plans are some of the most requested design for new home, in North Carolina and across the US. 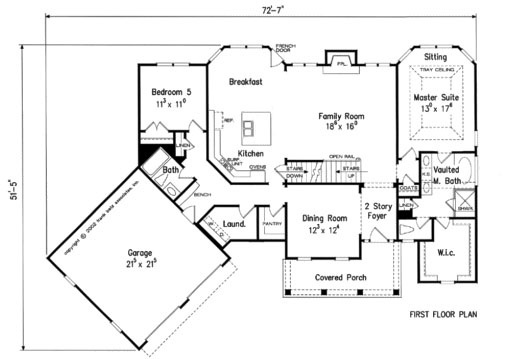 We'll show you what an open plan has to offer, using the Culpepper as a floor plan sample from architect Frank Betz. 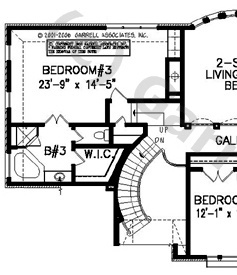 Take a look at the floor plans, below. On the first floor, we enlarged the island to create an eat-in space that spreads into the family room in order to take advantage of the open concept design. 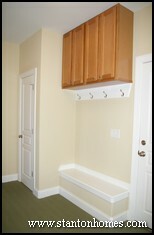 A hallway bench and walk in pantry offer tons of first floor storage space. 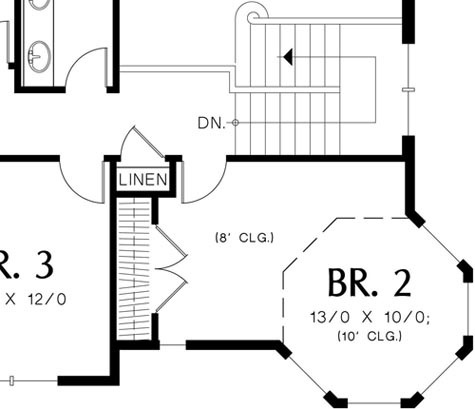 The fifth bedroom is located on the far side of the floor plan, close to the first floor bathroom, laundry, and garage entrance (as a "secondary" entrance zone away from front door traffic patterns). A first floor guest suite offers one method of multi-generational living. A sitting alcove in the master makes your retreat space more flexible. The en suite bath is a cost effective layout. A bonus room above the garage makes good use of space. The upstairs kids' rooms share a bathroom, while an optional guest bedroom has an en suite bath. 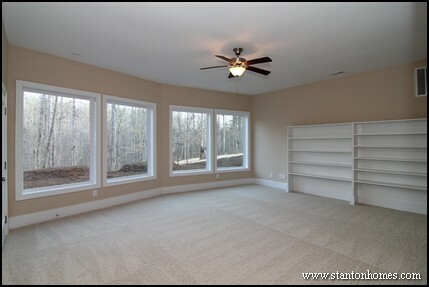 We added a game room to the floor plan, in place of the two story family room. 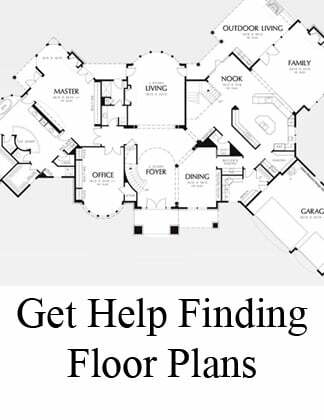 Want More Floor Plan Options? 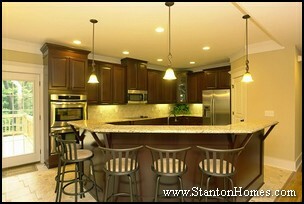 Stanton Homes Offers Nearly Endless Possibilities! 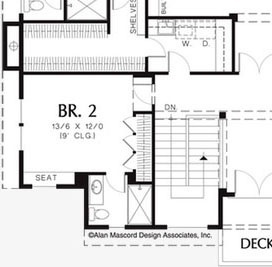 Get more floor plan ideas in our searchable gallery. 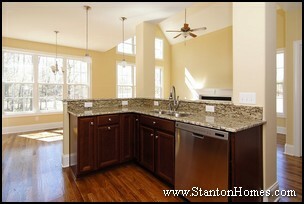 Or just ask Stanton Homes to find a floor plan you'll love - and stay in budget. Whether you love arts and crafts features or traditional home design, the Summerlake is a flexible plan with a range of exterior style options. 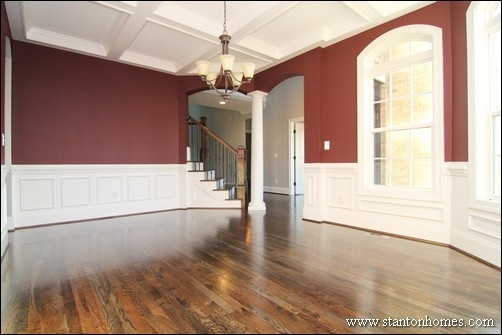 Downstairs, the a traditional layout opens from the foyer and formal dining room. The angled island kitchen overlooks the vaulted family room. A breakfast room and raised eating bar give informal eating space. The master suite is large, with connected his and hers vanities and separate changing area beside the shower. 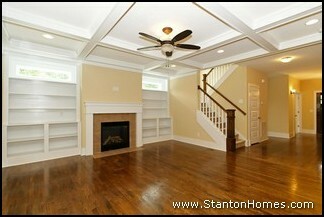 Upstairs, an open study loft / pocket office provide homework space for kids near the upstairs bedrooms and bonus room. 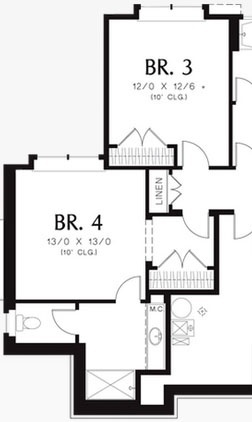 What makes a "Princess Suite" floor plan unique? 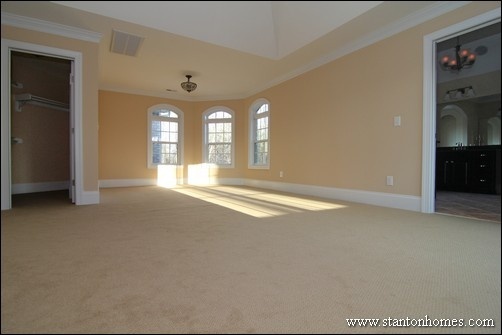 Some home buyers use the princess suite as a guest bedroom, with all the same amenities. 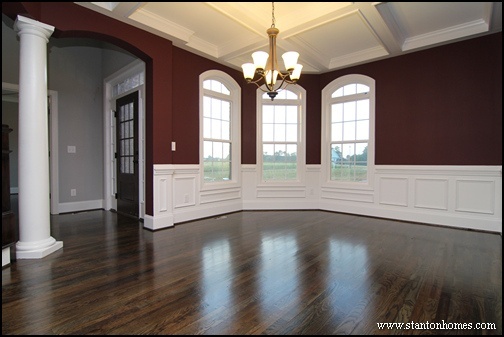 Search our floor plan gallery for princess suite home ideas. 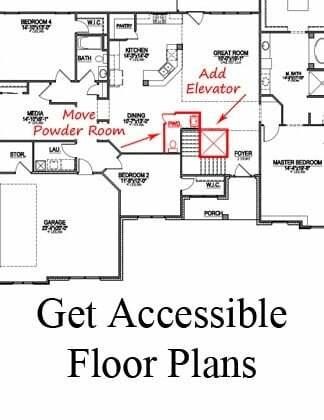 What does a Princess Suite floor plan include? 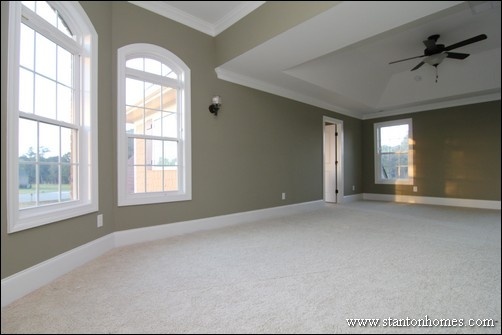 Take a look inside this Princess Suite from a version of the Avonstone Manor built by Stanton Homes near Raleigh, North Carolina: Click here for a full gallery of this custom home. 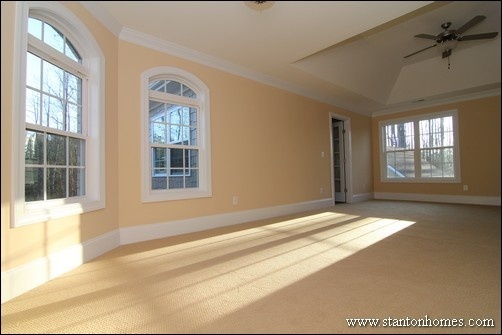 The Graystone Park, copyright Frank Betz, features a second floor Princess Suite with expanded walk in closet. This closet rivals master bedroom storage space. 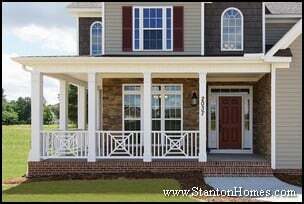 The Longleaf, home plan by Frank Betz, includes five bedrooms, four and a half baths, and a second story Princess Suite. The Princess Suite also includes a walk in closet - in a more typical size - as well as private bathroom. Bedrooms 3 and 4 share a Jack and Jill style bath. 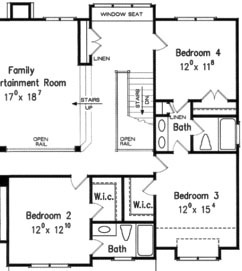 Typical secondary or "kids" bedrooms are generally 12'x12' or 12x11' for a total of 132 to 144 sq ft. 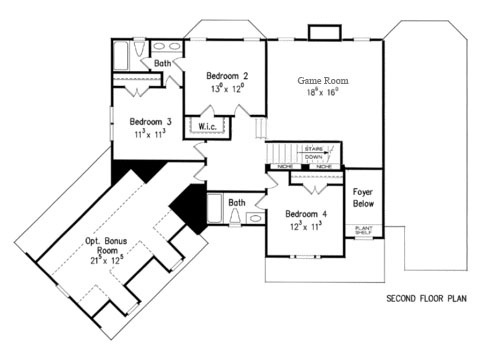 This floor plan, The Timbersedge by Alan Mascord, features an expanded secondary bedroom. The princess suite is 13'x13', not including the foyer-style entry and attached bath with separate toilet room and vanity area. This Princess Suite - from The Kensington copyright Alan Mascord - centers around the bay sitting area. 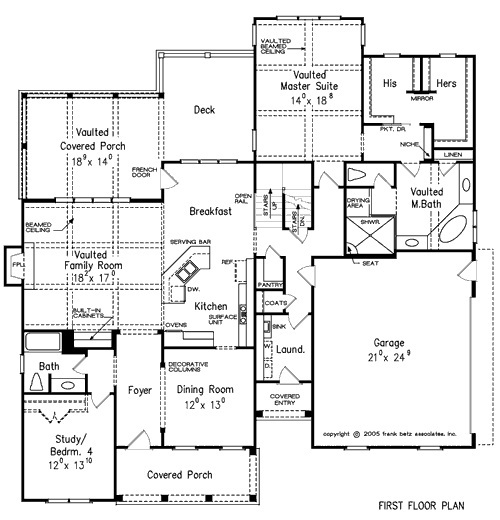 Tell us what floor plan you'd like to build, and we'll show you what it costs to build in central North Carolina. 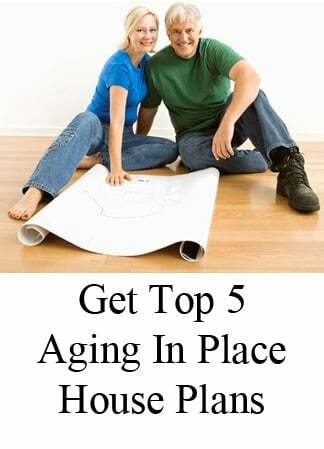 We'll get down to details, including full price estimates for all the floor plan features - and selections - you love. 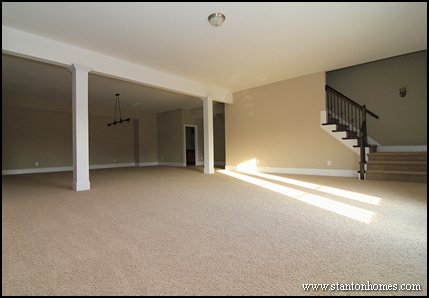 Looking for home plans with a basement for your "man cave", game room, or hang-out area? 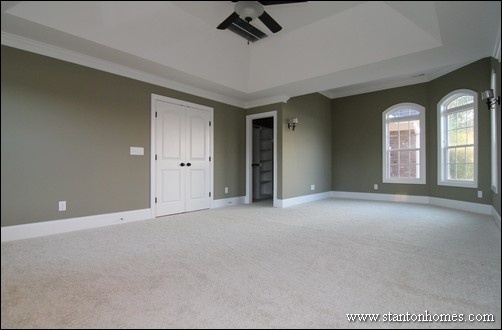 We're seeing more homes that incorporate a walk-out basement with opportunities for creating a "man cave" game room. This basement has a wall of windows with views to your mountain-front lot, a wall of built-in bookcases for easy storage, and a wall for your flat screen TV setup. This walk-out basement home offers a pool table room (with hanging light fixture to delineate the space), full bathroom, and a TV wall for game time. Your man cave doesn't need to go underground. 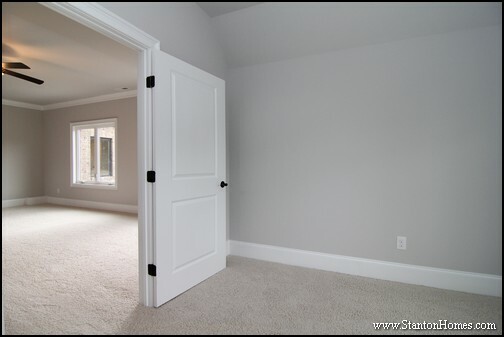 Consider converting a bonus room or bedroom into your personal space. 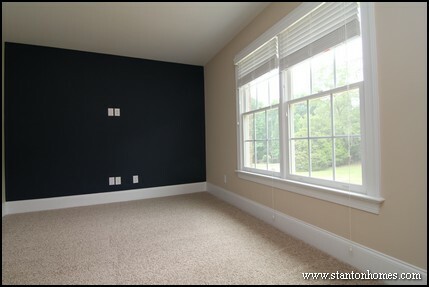 Personalize that space with a navy accent wall, ready for a flat screen TV. Into the latest technology? A bonus room with built-in surround sound speakers and smart-phone controls may be the perfect addition to your bonus room "man cave." 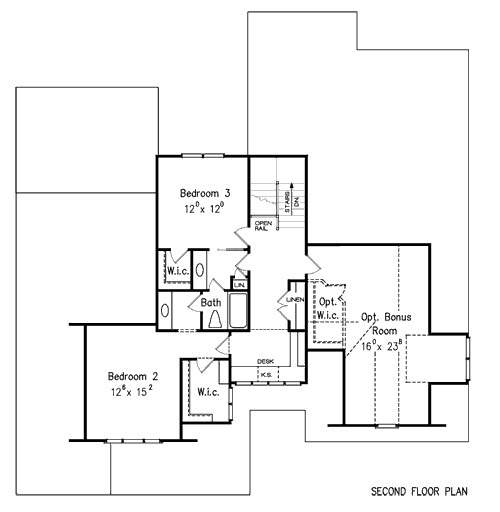 If you're looking for more privacy and seclusion, consider floor plans that have a room located through the bonus room - at the far end of your home. 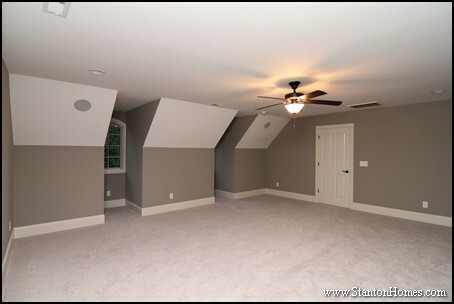 If you're searching for a Raleigh basement home, keep in mind that while walk-out basements are fairly common in the Triangle area of North Carolina, traditional full basements are not usually recommended. 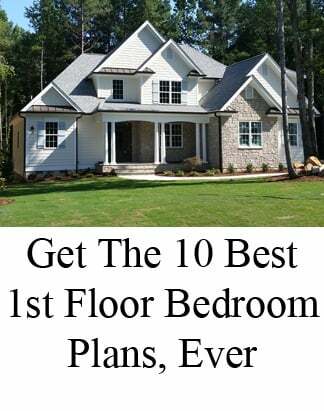 If your lot is sufficiently sloped, an unfinished or finished basement can offer lots of additional square footage, at a much lower cost per square foot than for "above ground" square footage.